FILIP, I. , PROSTEAN, O. , VASAR, C. , SZEIDERT, I. The paper presents an extended structure for a minimum variance adaptive control system of an induction generator, which aims to improve its operating behavior under electrical short-circuit conditions. The basic design idea is to limit the control to physically achievable values, and thus increasing the robustness of the control system and avoiding an instability regime. A control limiting block is proposed and used for this purpose. Moreover, a short-circuit detector enables an on-line setting of the control penalty factor, improving the quality of the controlled output. All these additional customizations of the control system, implemented to keep the plant operational under and after a short-time short-circuit fault (acting as an abnormal perturbation), must also provide good performance in the normal operating mode. M. J. Gomes Silva, C. Silva Araujo, S. T. Marques Bezerra, C. Rocha Souto, S. Arnaud Silva, and H. Pimentel Gomes, "Generalized Minimum Variance Control for Water Distribution System," IEEE Latin America Transactions, vol. 13, no. 3, pp. 651-658, Mar. 2015. Z. H. Dai, Y. A. Pan, and J. Yao, "Parameters Recursive Identification of Minimum Variance Control," Applied Mechanics and Materials, vol. 347-350, pp. 15-18, Aug. 2013. Y. Alipouri and J. Poshtan, "A linear approach to generalized minimum variance controller design for MIMO nonlinear systems," Nonlinear Dynamics, vol. 77, no. 3, pp. 935-949, Aug. 2014. I. Filip, I. Szeidert, O. Prostean, and C. Vasar, "Analysis through simulation of a self-tuning control structure for dual winded induction generator," In Proc. 9th IEEE International Conf. on Computational Cybernetics, Tihany, Hungary, 2013, pp. 147-152. I. Filip, O. Prostean, D. Ionescu, C. Vasar, and I. Szeidert, "Study above an adaptive control structure with aplication to a double-fed induction generators excitation," In Proc. IEEE - International Conference on Computer as a Tool, Lisbon, Portugal, 2011, pp. 1-4. R. N. P. Nagarajan, A. Bin Jidin, M. A. bin Said, S. Ramahlingam, M. N. Othman, and M. K Bin Abd Rahim, "Direct self control (DSC) of induction machine utilizing 3-level cascade H-bridge multilevel inverter," In Proc. 2014 IEEE Conference on Energy Conversion (CENCON), Johor Bahru, Oct. 2014, pp. 304 - 309. I. Szeidert, I. Filip, I. Borza, and C. Vasar, "Numerical simulation of a self-tuning control structure applied on double winded induction machine's excitation," In Proc. 6th IEEE International Symposium on Applied Computational Intelligence and Informatics (SACI), Timisoara, Romania, May 2011, pp. 603 - 606. Y. Uenaka, M. Sazawa, and K. Ohishi, "Self-tuning control of both current sensor offset and electrical parameter variations for PM motor," In Proc. 11th IEEE International Workshop on Advanced Motion Control, Nagaoka, Niigata, March 2010, pp. 649 - 654. V. Radulovic, S. Mujovic, and Z. Miljanic, "Characteristics of Overvoltage Protection with Cascade Application of Surge Protective Devices in Low-Voltage AC Power Circuits," Advances in Electrical and Computer Engineering, vol. 15, no. 3, pp. 153-160, 2015. 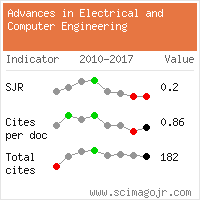 O. Garcia, J.-C. Hernandez, and F. Jurado, "Guidelines for Protection against Overcurrent in Photovoltaic Generators," Advances in Electrical and Computer Engineering, vol. 12, no. 4, pp. 63-70, 2012. X. Pei and Y. Kang, "Short-Circuit Fault Protection Strategy for High-Power Three-Phase Three-Wire Inverter," IEEE Transactions on Industrial Informatics, vol. 8, no. 3, pp. 545-553, Aug. 2012. R. Pan, J. Liu, M. Wang, Y. Liu, and H. Hou, "Ultra-Real time Short Circuit Current Computing Based on Ultra-Short term Load Forecasting," In Proc. Asia-Pacific Power and Energy Engineering Conference (APPEEC), Chengdu, China, March 2010, pp. 1-5. Eui-Cheol Nho, In-Dong Kim, Tao-Won Chun, Heung-Geun Kim, and Cheol-Je Joe, "Rising time minimization of DC voltage after output short-circuit of a boost type rectifier," In Proc. IEEE International Symposium on Industrial Electronics, vol.2, Pusan, Jun. 2001, pp. 1038-1043. Y. Jiang-Häfner, M. Hyttinen, and B. Pääjärvi, "On the short circuit current contribution of HVDC light," In Proc. IEEE PES Transmission and Distribution Conference and Exhibition, Yokohama, Japan, Oct. 2002, pp. 1926-1932. 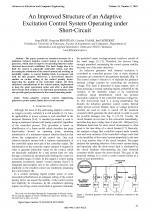 B. de Metz-Noblat, F. Dumas, and C. Poulain, "Calculation of short-circuit currents," Cahier Technique Schneider Electric, no. 158, Sept. 2005. I. Filip and I. Szeidert, "Givens Orthogonal Transformation-based estimator versus RLS estimator-case study for an induction generator model," Advances in Intelligent Systems and Computing. Soft Computing Applications, vol. 357, no. 2, Springer, pp.1287-1299, Nov. 2015. K. Ando, S. Masuda, and K. Terakado, "A Direct Control Parameters Tuning Method Using CARMA Models Based on Minimum Variance Evaluation," IEEJ Transactions on Electronics, Information and Systems, vol. 134, no. 8, pp. 1123-1129, 2014. G. Abad, J. Lopez, M. Rodriguez, L. Marroyo, and G. Iwanski, Doubly fed induction machine: Modeling and control for wind energy generation applications, NJ: IEEE Press, 2011. pp. 209-239. J. M Aller, D. Delgado, A. Bueno, and J. C. Viola, "Model of the induction machine including saturation," In Proc. 15th European Conference on Power Electronics and Applications (EPE), Lille, France, Sept. 2013, pp. 1-8. I. Filip, I. Szeidert, and O. Prostean, "Mathematical modelling and numerical simulation of the dual winded induction generator's operating regimes," Advances in Intelligent Systems and Computing. Soft Computing Applications, vol. 357, no. 2, Springer, pp. 1161-1170, Nov. 2015. Y. Zou, M. Elbuluk, and Y. Sozer, "A complete modeling and simulation of induction generator wind power systems," In Proc. IEEE Industry Applications Society Annual Meeting (IAS), Houston, USA, Oct. 2010, pp. 1-8. I. Filip and C. Vasar, "About initial setting of a self-tuning controller," In Proc. 4th International Symposium on Applied Computational Intelligence and Informatics, Timisoara, Romania, May 2007, pp. 251 - 256. M. Doi, K. Nagamoto, K. Idenawa, and Y. Mori, "Design of Generalized Minimum Variance Control for Improving Ships Steering Performance on Low Speed," Transactions of the Society of Instrument and Control Engineers, vol. 47, no. 9, pp. 396-403, 2011. M.-Y. Wei and T.-H. Liu, "Design and Implementation of an Online Tuning Adaptive Controller for Synchronous Reluctance Motor Drives," IEEE Transactions on Industrial Electronics, vol. 60, no. 9, pp. 3644-3657, Sep. 2013. I. Filip and O. Prostean, "Modeling, parameters estimation and adaptive control of a synchronous generator," Journal of Control Engineering and Applied Informatics, vol. 7, no. 1, pp. 20-30, 2005. Y. Alipouri and J. Poshtan, "Non-affine minimum variance controller design by inverse modeling procedure," Nonlinear Dynamics, vol. 78, no. 4, pp. 2675-2684, Dec. 2014. K. J. Zachariah, J. W. Finch and M. Farsi, "Multivariable Self-Tuning Control of a Turbine Generator System," IEEE Transactions on Energy Conversion, vol. 24, no. 2, pp. 406-414, June 2009. R. Bhattarai, N. Gurung, and S. Kamalasadan, "Minimum variance adaptive speed estimation technique for vector control of Doubly Fed Induction Generator," In Proc. North American Power Symposium (NAPS), Charlotte, USA, Oct. 2015, pp. 1-6. P. Nuutinen, P. Peltoniemi and P. Silventoinen, "Short-Circuit Protection in a Converter-Fed Low-Voltage Distribution Network," IEEE Transactions on Power Electronics, vol. 28, no. 4, pp. 1587-1597, April 2013. Citations for references updated on 2019-04-21 20:43 in 189 seconds. Website conception, design and maintenance by Eugen COCA. Content updated on 28 Feb 2019. Site engine updated on 28 Feb 2019. This page was generated on the server in 0.094 seconds and loaded in your browser in > seconds.